Your backyard shed is full of old objects, and you cannot find the time and energy to clean it out? Better Cleaning Company is a professional rubbish removal North London BR company that excels in home and office garbage clearing and disposal. Contact now - 020 3746 3201. We are seasoned in supplying hassle free and fast garden waste collection North London BR. We will gather all grass, tree trimmings, hedge, hay, leaves, unwanted plants and weeds, wood and several other garden waste and will load and dispose of it at a fair price. Our waste management team can cope with green waste removal, brown waste removal as well as recycling & dumping. Rubbish Collection Company in North London - The Highest Rating On The Market! 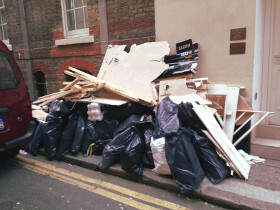 Rubbish collection service in North London is provided by Better Cleaning Company. Top-notched cleaning company with substantial experience in removal services, as well. We have been on the market for 10 years and we do know how to satisfy and please our clients. As a matter of fact, your positive feedback is the best value we receive from our reliable rubbish removal solutions. Accepting this as our practice, we have succeeded to build up the fasted and the most affordable rubbish removal offers across the whole North London territory. Note that we are aware of all the dumpsters and recycling centres in Great Britain, so wherever your location is, we will move the garbage to the closest centre without disturbing you to seek for such. Our hassle-free rubbish collection service is completed by specially educated, qualified experts. They are all vetted and totally insured. Don`t hesitate to ask for an advice or discuss the waste disposal in North London with the operators until they find the most effective alternative for you. It`s their job. Note that the service is first quoted, because neither the cost nor the duration is fixed. The junk removal specialists come to analyze the house – loft, garage, apartment, house, basement, commercial IT or Tyre building, warehouse, etc – to see its size and to check the volume and the type of the rubbish. Then, the price is set and the date for the junk removal is settled. When you consent, the removal staff are ready to respond ASAP! If you need to get our top quality rubbish removal services North London BR, you need to contact our 24-7 phone line 020 3746 3201 or submit an online request form for a free viewing or directly ordering our service. Better Cleaning Company guarantees a quick arrival of our skilled two men squads at your property. They will inspect the volume of the waste materials, and will offer you a price quote right away. Collection and loading will commence immediately after that. As a licensed rubbish waste carrier we always do the recycling on your behalf.